The storm surge, The name of the storm in Manila Philippines, is in the bay caused by Typhoon ferociously strong winds, and not simply rainwater, it could have produced the floods. 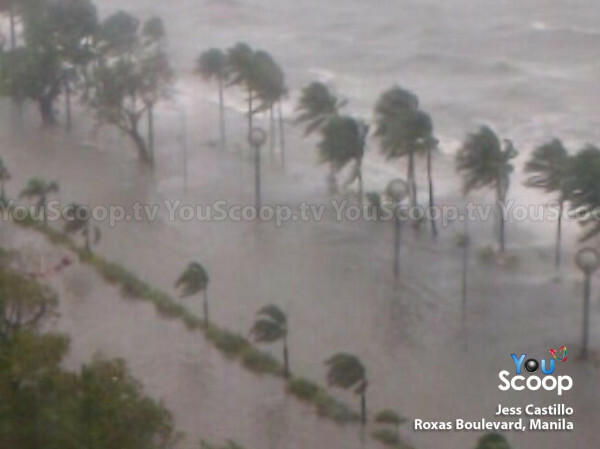 according to the weather forecast Much of Rojas Boulevard was similarly submerged, as well as United Nations Avenue and other areas of Metro Manila Philippines according to weather forecaster said that the flooding on Rojas Boulevard, Manila could also be the result of swells or tall waves that follow the passage of a storm. its clarified that storm surges occur in the center of a storm I think some of us dont understand what's happening in our country Philippines but in some cases this is a natural phenomenon due to climate change. The sea level also rise every year because of Global warming we have to know that typhoon is coming every summer until the end of the year some people don't look the weather forecast and don't have preparation due to busy works and other stuffs. some residents live in the very far country place or in the provinces it could be scared for them to live nearby up hills but there is proto call once there's typhoon coming I hope they can evacuate to the centers I feel sad for them.